I'm hosting an Election Event and We're Livestreaming it! As part of my AIC work, I'll be hosting tonight's "US Election and Middle East Foreign Policy" event featuring Dr. James Zogby from the Sanders campaign and Richard Nephew from the Clinton campaign. We've invited the two men to speak about their candidate's foreign policies toward the Middle East as well as take some questions. We'll also be live streaming the event, which you can watch right here at 6pm today! In this 'Iran Chat' interview with Richard Nephew, the former lead sanctions expert for the US team negotiating with Iran, AIC Director of Communications Kayvon Afshari discusses a host of issues concerning US-Iran relations, including the implementation of the nuclear accord, the recent changes to the visa waiver program, and how post-sanctions era Iran will affect global energy prices. VIDEO: What's the Deal with the New Visa Waiver Restrictions? The new visa waiver restrictions are complicated and can be confusing to understand. Fortunately, AIC's Kayvon Afshari breaks it down by interviewing a lawyer from the ACLU, a former American nuclear negotiator, and an Iranian-German dual citizen who was recently affected by the law. Watch the video, then share it with your friends who need to learn about the issue! As part of my work for the American Iranian Council, I recently moderated a discussion with Ambassador Dennis Ross and Dr. Hooshang Amirahmadi on the topic of countering ISIS and Islamist extremism. The event was hosted at Marymount Manhattan College and is part of a series of events we're co-organizing with the college. I'm looking forward to more thoughtful and fruitful events with them. I moderated a panel discussion on the Iran nuclear accord featuring Amb. William Luers, Prof. Patricia DeGennaro, and Mr. Jack Hayes. The event was co-organized by the American Iranian Council and Marymount Manhattan College. In this interview with HuffPost Live, AIC Director of Communications Kayvon Afshari discusses Senator Chuck Schumer's recent announcement that he will oppose the nuclear deal with Iran. Afshari points out that Schumer makes maximalist demands of Iran, saying, "One of the demands that he makes is 'anytime, anywhere' access to any of Iran's non-nuclear, military facilities. Iran is not a defeated party here. Iran is not Imperial Japan, which had two atomic bombs dropped on it and is acceding to terms of surrender. Iran has been negotiating on this issue for a long time." I talked some more about the Iran nuclear deal with HuffPost Live’s Alyona Minkovski. 2. attitudes in Iran need to dramatically shift in order to prepare the country for these broader talks with the US— a government which the Islamic Republic’s leaders have viewed suspiciously as “the Great Satan” for 36 years. 4. the Obama administration used the recent Camp David summit with Arab leaders as a giant arms sale bonanza for Lockheed Martin, Raytheon, etc. In this interview with HuffPost Live, AIC Director of Communications Kayvon Afshari underscores the significance of a potential nuclear deal to the Obama administration, as well as the importance of the P5+1 countries and Iran having the same understanding of any final deal. He says, "I think that it's more important that they take the time now to deal with these really technical issues and achieve perfect clarity in the negotiations phase rather than walk away from it and have somewhat different interpretations in the implementation phase." Afshari emphasizes the progress made in the form of Iran's concessions concerning its nuclear program, which go beyond the Non-Proliferation Treaty and the Additional Protocol. He says, "The Iranians have made major concessions here. Iran, as a non-weapons signatory to the NPT, has the right to produce nuclear power for peaceful purposes." He adds that this progress owes to the Obama administration's willingness to shift from a policy of zero enrichment to limited enrichment, which helped the parties find common ground. “What a successful nuclear deal would do is set a precedent whereby diplomatic engagement will have peacefully resolved such a thorny 15 year old international issue. This is not just a deal about centrifuges and uranium enrichment this is about mistrust between the US and IR. there are huge issues that have separated these countries for the past 36 years. An honest inspection of this relationship has to conclude that the mistrust runs both ways and that both sides have harmed each other," he said. I discussed the ongoing nuclear negotiations with The Majority Report's Michael Brooks. I argued that there is a serious lack of intellectual honesty in the ongoing discourse in the United States, and explained the domestic politics in Iran over the issue. In my interview with HuffPost Live, I stressed the importance of having an "intellectually honest" discussion on the nuclear negotiations and argued that Iran has made significant concessions. It got heated at a few points, but by sticking to the facts, I made my point more clearly than the detractors. Kayvon Afshari sits down with Another Thing's Larry Mendte, to discuss the Iran nuclear negotiations, which faces staunch opposition domestically both in the U.S. and Iran. Despite harsh realities, Afshari remains optimistic that a nuclear agreement will be reached. Afshari stressed that, "The Obama administration has expended a great deal of political capital on the negotiations and along with the high stakes implications involved, the administration needs a win. Robert Einhorn, former senior advisor to the US nuclear negotiating team, discusses the Iranian nuclear issue in this exclusive interview with the AIC's Kayvon Afshari. Mr. Einhorn says that, while existing sanctions have played an "important role" in bringing Iran to negotiate very seriously, new sanctions are not necessary at this time. I interviewed Dr. Gary Sick, who served in President Jimmy Carter's National Security Council, on US-Iran relations. He says that the core issue separating the two countries isn't the nuclear issue, terrorism, or human rights. It's history. Watch the interview for more. After three days of serious, high-level talks in Geneva, the P5+1 announced that a deal has yet to be reached on Iran’s nuclear program. 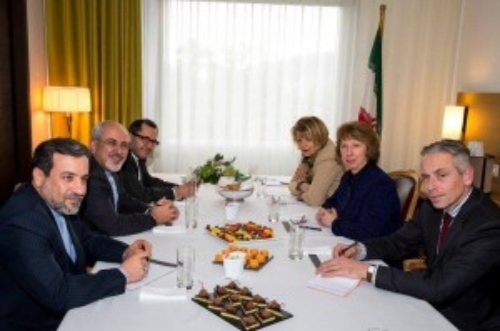 Catherine Ashton, the European Union foreign policy chief, said that they would meet again on November 20th at the senior diplomat level, rather than the foreign minister level. Secretary of State John Kerry tried to stay upbeat, telling journalists, “We came to Geneva to narrow the differences, and I can tell you without any reservations, we made significant progress. It takes time to build confidence between countries that have really been at odds with each other for a long time now,” he said. Can Obama and Rouhani Make Peace? Dr. Hooshang Amirahmadi and I answer the question "Can Rouhani and Obama Make Peace?" in the latest issue of Foreign Policy Research Centre's journal. Hint: Yes they can, but it will be very difficult.